A home-made afternoon tea is a wonderful treat for Mother’s Day. This year, we want to help you prepare a beautiful spread of delicious treats that can make you feel good too. Here are our eight favourite recipes to help you make a delicious, guilt-free afternoon tea. 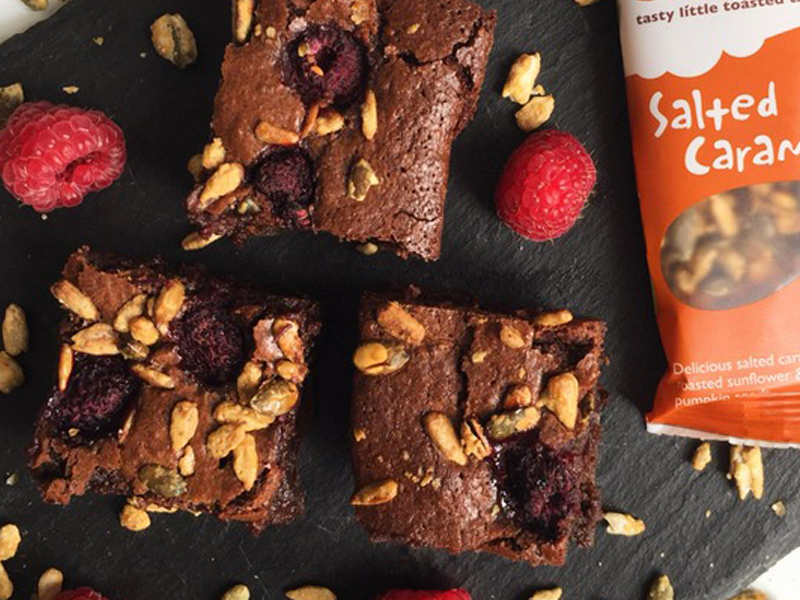 If her favourite flavour is chocolate, then we would love to suggest these gooey Salted Caramel and Raspberry Brownies. This is a classic brownie recipe which is enhanced by our munchy Salted Caramel Seeds. Mix up the flavours of your afternoon tea with our energising Honey and Lemon Bliss Balls. Make a big batch of these and save any leftovers to have as a snack at work or at the gym in the week. They’re gluten free, dairy free and free from refined sugar too! Afternoon tea would not be complete without a Victoria Sponge cake. In our delicious recipe below we have added a healthy touch with fresh strawberries and sprinkles of Honey Seeds. Show your mum some love with our popular Shortbread Heart Biscuits. These beautiful buttery biscuits also make a brilliant Mother’s Day gift. Quick to make, this Choccy Apricot Rocky Road recipe is a much more healthy alternative to a traditional chocolate rocky road. Chop them up into scrumptious bite-sized pieces. Last of all – don’t forget the tea! These treats are all best accompanied with a steaming cup of tea and a good chat! For a healthy choice, you might want to consider fresh mint tea or green tea. We would love to see your beautiful afternoon tea spreads. Share your photos on social media and tag us @munchyseeds and hashtag #munchyseeds. Oh wow, these look fantastic! I’ve stumbled across them too late for mother’s day, unfortunately, but I still think I’ll try putting on an afternoon tea for family or friends. I LOVE the sound of the salted caramel granola bars.